Tequila is made from distilled sap from hearts (pi as) of the agave or maguey (pr. 'mah-gay') plant A mature agave has leaves 5-8 feet tall, and is 7-12 feet in diameter The name agave comes from the Greek word for 'noble.' Size Shipped: 4.5" pot. Tequila is made from distilled sap from hearts (pi as) of the agave or maguey (pr. 'mah-gay') plant. This plant is actually related to the lily and amaryllis (it has its own genus, Agave). It is known as a succulent and, although it shares a common habitat with many cacti, it is not one itself and has a different life cycle. A mature agave has leaves 5-8 feet tall, and is 7-12 feet in diameter. The name agave comes from the Greek word for 'noble.' There are 136 species of agave in Mexico, of which the blue agave - agave tequilana weber azul - is the only one allowed for use in tequila production. Several different species of agave are allowed for use in mezcal, including a rare wild species, tobala. Other agave plants are used for the production of various regional drinks like sotol, raicilla, bacanora and pulque. Agave has been cultivated on this continent for at least 9,000 years. 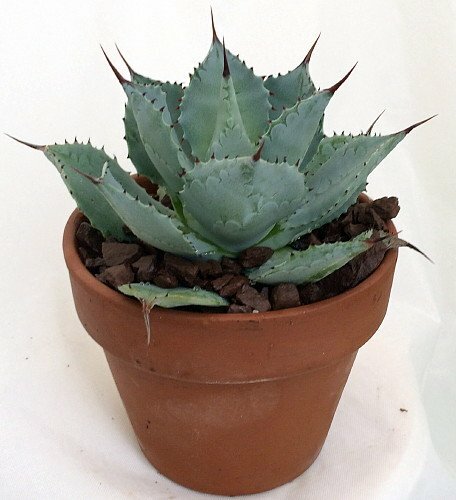 Many people tend to think that cacti and succulents are too difficult to care for and decide against even buying them. As it turns out, many people are simply caring for them too much or too often. Cacti and succulents will do quite well under the same conditions which would be considered neglect with other plants. -Watering- The most common problem people have with cacti and succulent plants is overwatering. They are 'water storing' plants and will do better with less water than they will with more. Since every situation is considerably different, there is not set time interval for when to water cacti and succulents. Many factors play a role in the timing (such as humidity, light, and temperature). Cacti and succulent plants can survive a wide range of temperatures, but it is preferable that they are kept in a warm bright location for the best results, and the most beautiful color.